Water is the next item on our emergency preparedness agenda. Pack at least one purchased, unopened 16 oz. water bottle in each emergency bag. If you don't have bottles of water to pack, put them on a shopping list. It doesn't matter what brand you choose, just find something that satisfies your budget and your aesthetics. If you are feeling ambitious, you can start your long-term emergency water supply now too. The standard advice is that you need a gallon of clean drinking water per household member, per day, and that you should have at least a 3-day supply of water available. Include any pets in your calculations--no, hamsters don't drink a gallon a day, but extra water is always a good thing. You can purchase bottled water ready for storage. 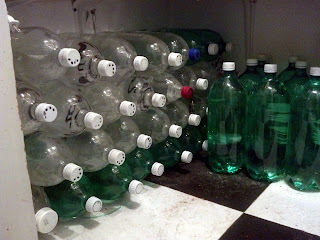 You can also purchase 3- and 5-gallon bottles either already filled or empty to refill yourself. We have a 5-gallon bottle with a pump on it so it doesn't have to be tipped over to use it. Or you can save bottles that have held other drinks and refill those--that's kind of a two-for-one purchase. Plastic bottles used for soda are ideal. They are very sturdy and are made to withstand the pressure of carbonation. To clean the bottles, run very hot water inside and out, including the cap. You can use a little dish soap if you want but make sure to rinse completely. The hot water will loosen the label enough to remove easily. If you have chlorinated water, just fill the bottles to overflowing--rinse the cap with the same water--then replace the cap while the water is overflowing the bottle. In this way you will make sure that every part of the inside of the bottle and the cap have been in contact with the chlorine, and that there is no air gap at the top of the bottle. If you do not have chlorinated water, you can treat it yourself. For every 2-liter bottle, use 4 drops of unscented chlorine bleach, fill to overflowing, cap, shake to distribute. Store your water in a place where it won't freeze.